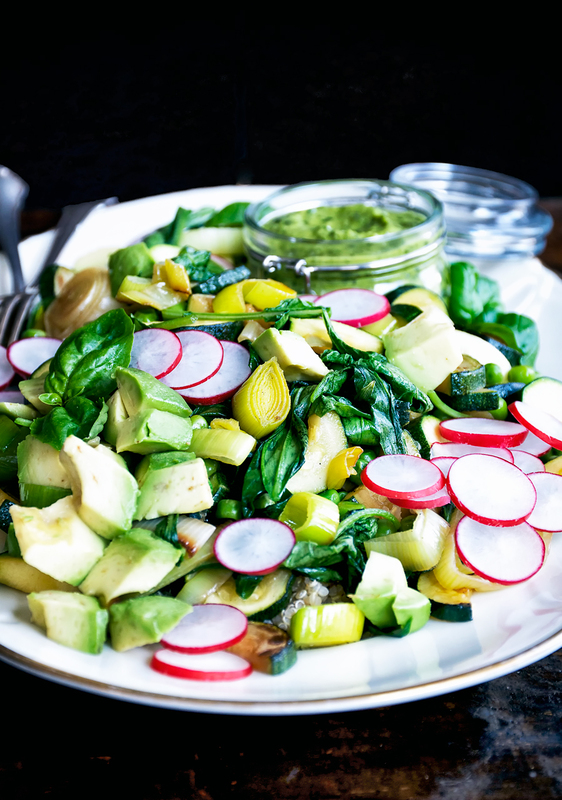 This spring greens salad features wild garlic, leeks, peas, and an avocado wild garlic sauce. 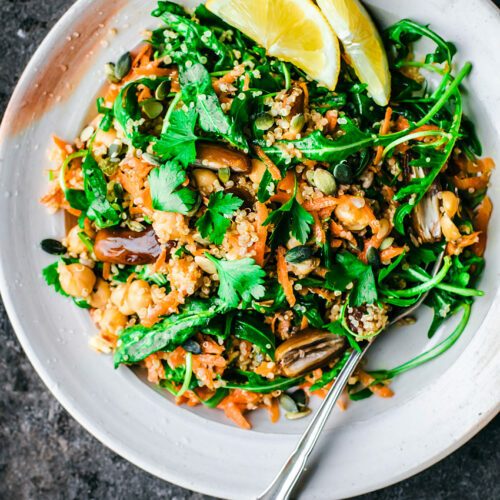 There’s quinoa hiding under all those veggies – but the stars here are all of those beautiful seasonal greens. This salad is a good example of something that we eat a lot, changing out the vegetables for whatever’s in season locally. Right now that means everything green, and radishes. Wild garlic/ramps/bärlauch grows extensively in forested areas and it’s available from March to May. You can buy it at farmers’ markets at this time of year and it can also be grown in your garden – but if you’re gathering it yourself, just remember to be cautious and not to over harvest. Wild garlic has a strong garlicky taste that goes really well with this salad. 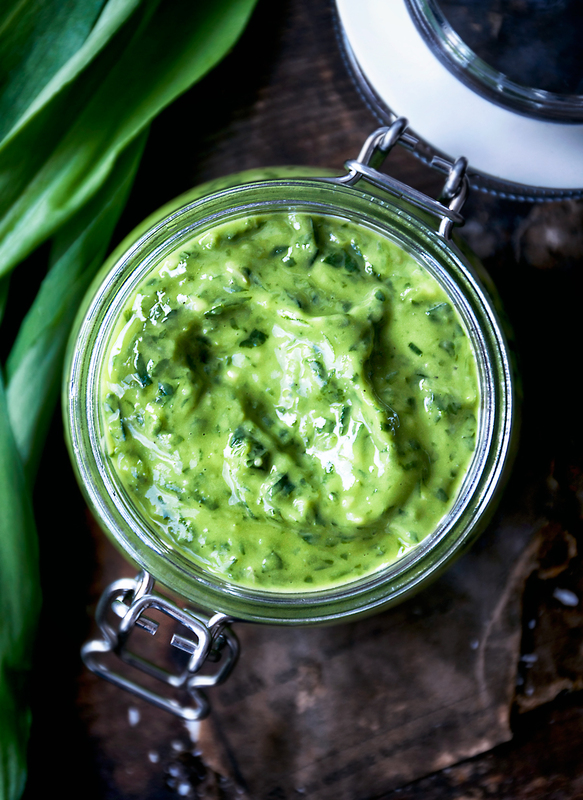 If you can’t find any you can just use your favourite pesto recipe with some avocado blended into it, and a little extra garlic (but please try to seek out wild garlic for this recipe!). 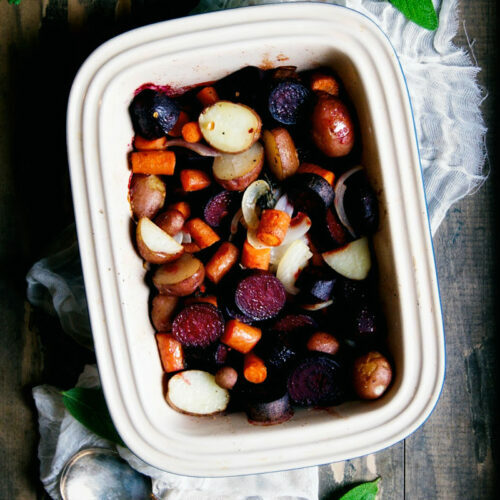 You can, of course, use different vegetables based on what you have on hand. Green asparagus isn’t quite ready yet so I avoided using it in this recipe, but you could add it if you’d like. You could add spinach or chard, broccoli, fiddleheads, snow peas, or any other green vegetables. Substitute another grain like millet or amaranth for the quinoa, add lentils, do whatever you want. The dressing/sauce is what makes this dish special and it’s also very good on bread, crackers, and everything else we were eating. So if nothing else, make the sauce and put it on everything. It might be worth noting that Graham and I ate this whole spring greens salad for lunch. If you’re serving it as a side to something else (try falafel with it) then it will probably serve four people quite easily. If you’re starving because someone had to photograph the salad before eating it, then it only serves two. 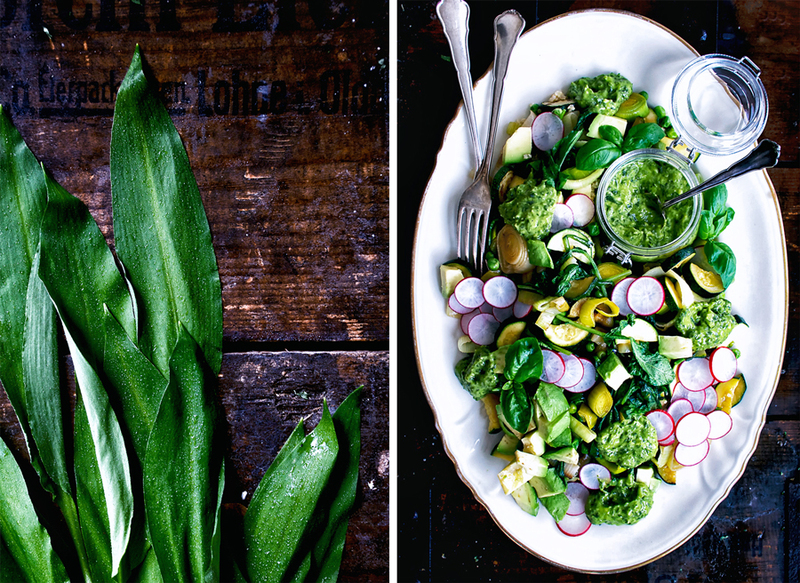 This spring greens salad features wild garlic, leeks, peas, and an avocado wild garlic sauce. There's quinoa hiding under all those veggies, too. 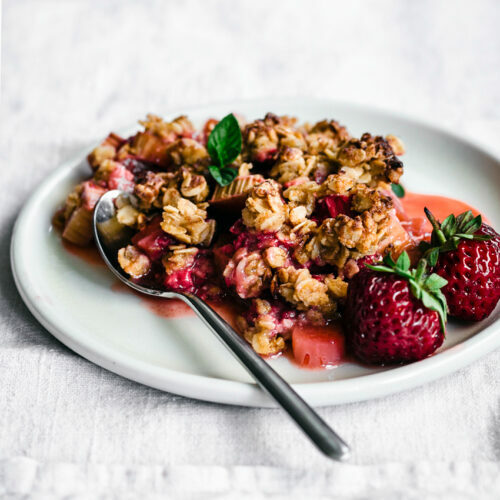 Place the quinoa, water, and salt into a medium saucepan. Bring to a boil and then reduce the heat and let it simmer for 10-15 minutes, or until all of the water has been absorbed. Set it aside while you finish the vegetables. While the quinoa is cooking, heat a pan over medium heat with the coconut oil. Add the leeks and zucchini, and cook for about 2 minutes or until lightly golden and softened. Stir in the radish greens and cook for an additional 30 seconds, then add the peas and garlic. Stir to combine, then turn off the heat and place a lid on the pan to gently cook the peas and ramps. Thinly slice the radishes and cut the avocado into cubes. 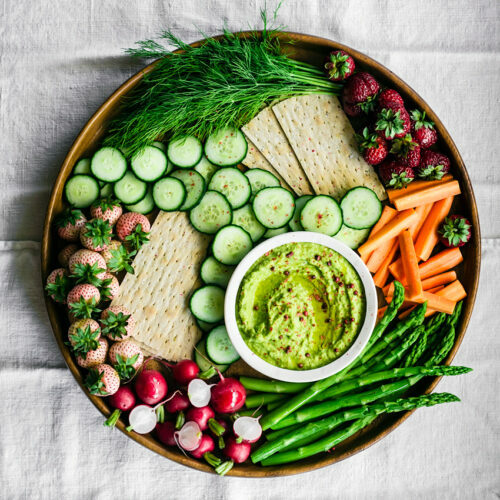 To assemble the salad, place the cooked quinoa onto a serving platter and top with the cooked vegetables, radishes, and avocado. Place spoonfuls of the wild garlic sauce over the salad and serve warm, with extra sauce on the side. Add the wild garlic, basil, avocado, and lemon juice to a small blender or food processor. Blend until fully combined, and then slowly pour in the olive oil while blending until incorporated. If you can't blend/pour at the same time, then add the olive oil in four increments, blending each time. Season to taste and serve. 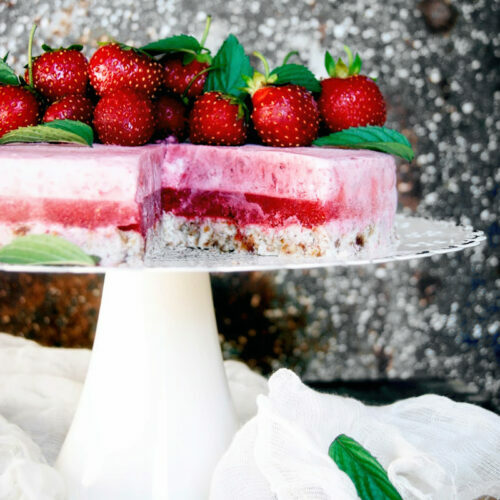 This keeps well in the fridge for up to two days. I yummed it and pinned it to my salad board! It represents my kind of salad and it is what most of my lunches look like, just changing greens and grains, adding, subtracting. And your sauce is so flavorful. Beautiful! 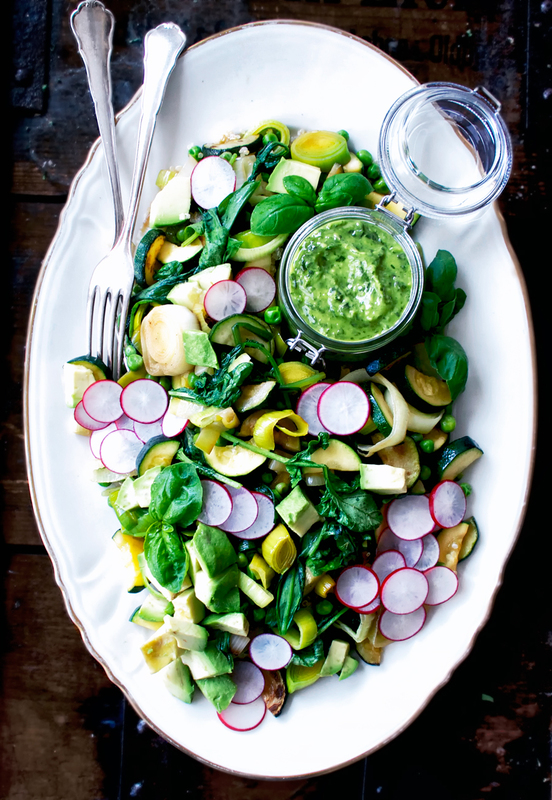 Ramp season is one of my favourite times of the year and this salad is calling my name. Yum — this is my favourite kind of meal! You can't beat a big, fresh salad made with delicious seasonal ingredients. You've done such a beautiful job with this salad, Alexandra! Pinning for inspiration. 🙂 Enjoy the rest of your Sunday! This salad looks so good! 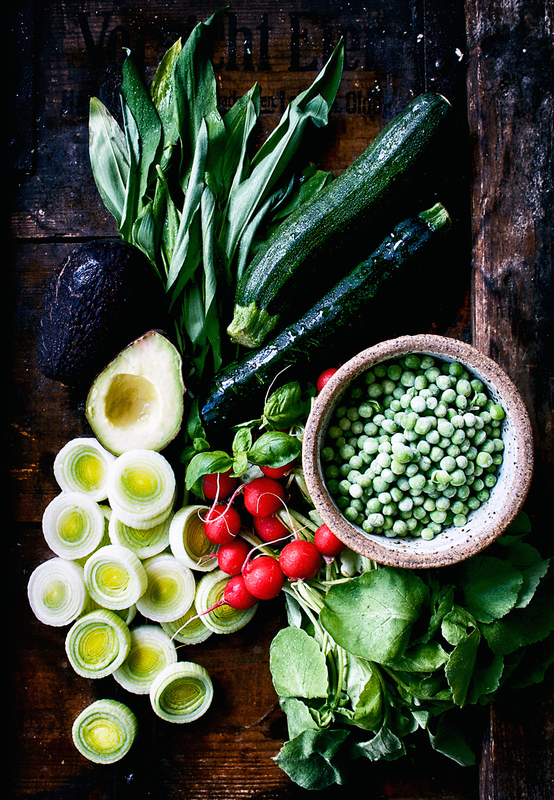 Full of the fresh spring ingredients that I have been craving! Pinning this to make ASAP! Thanks, Nicoletta! Exactly, it's such an easy, adaptable meal. Thanks, Sophie! I was surprised by how readily available they are here – definitely seasonal, but in abundance in gardens as well as the forest. This is one gorgeous, in season salad, Alexandra! So much color and that sauce gives me heart eyes! Ramps are difficult to find here.. but I'm always on the look out!